Beginning with a trial of 1,100 public housing properties, 5 kilowatt solar panels and 13.5 kilowatt-hour Tesla Powerwall 2 batteries will be installed free of charge and financed through electricity sales, the state government said Sunday ahead of a state election next month. This will be expanded to another 24,000 public housing properties, and then a similar deal will be offered to all South Australian households, with a plan for at least 50,000 to participate in the next four years. Once completed, the virtual power facility could provide as much capacity as a large gas turbine or coal power plant, Tesla said in a statement. Billionaire Elon Musk last year built the world’s biggest lithium-ion battery system to support South Australia’s blackout-plagued power grid. Musk made a bet on Twitter that Tesla could install a 100-megawatt storage facility in the Australian outback within 100 days or it would be free — and made good on his pledge to be finished by summer. Australia, one of the world’s biggest users of rooftop solar panels, likely added the most new capacity on record last year as electricity users sought to ease escalating power bills. 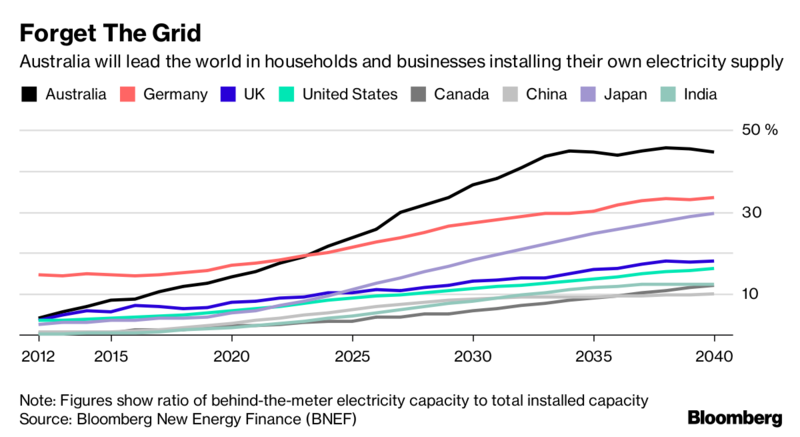 While subsidies and generous feed-in tariffs helped boost growth earlier this decade, last year’s gains were driven by users seeking to sidestep a surge in the cost of electricity and a push by vendors into the commercial sector, according to Bloomberg New Energy Finance. South Australia, which will hold an election March 17, suffered a state-wide blackout in 2016 when storms caused a transmission failure. Australian Prime Minister Malcolm Turnbull blamed the power cut on the state’s rapid take-up of renewable power. Solar and wind make up about 40 percent of its power generation, the highest of any mainland Australian state. Rooftop solar will account for as much as 24 percent of Australia’s electricity by 2040, according to BNEF’s 2017 New Energy Outlook (NEO). When combined with small-scale batteries and demand response initiatives, up to 45 percent of the country’s total power capacity will be located on owners’ properties — known as behind-the-meter-capacity — by 2040. BNEF clients can download the full NEO report here. Weatherill on Sunday cited analysis by Frontier Economics as showing the 250 megawatts of power generated by the 50,000 homes was expected to lower energy bills for participating households by 30 percent. Up to 600 homes will receive Powerwall batteries and solar panels in 2018 under the South Australia plan, Tesla said.